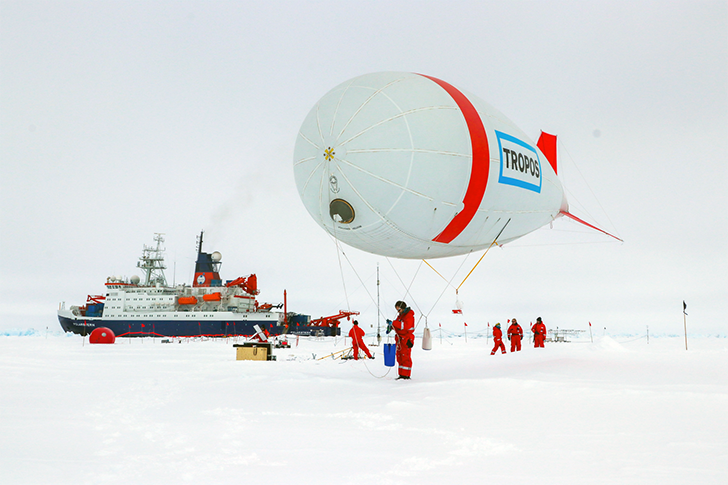 Tethered balloon operation during the Polarstern expedition PS106. Stepan Schön, Sächsische Zeitung. The main objective of the conference is to bring together scientists studying the complex interplay between atmospheric physics, ocean dynamics, marine biology and biogeochemistry in the coupled Arctic system. The conference is addressing participants from previous Arctic expeditions like those from the recent Polarstern expedition PS106 in summer 2017 and from previous similar Arctic expeditions, such as ACSOS, TRANSSIZ, N-ICE, the Barents Sea Ecosystem Survey (IMR, PINRO) as well as representatives of the coming one-year ice-drift MOSAiC (see below) of RV Polarstern. A large but not exclusive part of the conference aims at fostering multi-disciplinary scientific research of the research projects PASCAL (Physical feedbacks of Arctic PBL, Seaice, Cloud And Aerosol) and SiPCA (Survival of Polar Cod in a Changing Arctic Ocean) as well as related sea ice physics and physical oceanography projects, all contributing to the expedition PS106. Besides its individual scientific purpose, PS106 and its two-weeks ice-drift station is recognized in the international scientific community as the prototype expedition for the one-year ice-drift MOSAiC (Multidisciplinary drifting Observatory for the Study of Arctic Climate), scheduled for October 2019 to October 2020 (see MOSAiC implementation plan, mosaicobservatory.org). Thus, we find it timely and of uttermost scientific relevance to provide the best possible scientific basis for MOSAiC by means of this international conference. From a practical point of view it is worth mentioning that a large number of participants of PS106 are scheduled for MOSAiC already, so that it is guaranteed that the outcome of the proposed conference will be integrated into the MOSAiC planning, performance and analysis. The coupled Arctic climate system undergoes the fastest changes in the climate system, what is denoted as the "Arctic Amplification". A number of national and international projects are currently working towards a better understanding of the Arctic and causes and consequences of the rapid sea ice decline. Most prominently in Germany is the Collaborative Research Cluster TR 172 (AC)3 "Arctic Amplification: Climate Relevant Atmospheric and Surface Processes, and Feedback Mechanism". The atmospheric observations of PS106 and its scientific analysis are essential contributions to (AC)3. In response to atmospheric transformations, the Arctic sea ice environment and the unique ecosystem it hosts are undergoing pronounced changes. To understand these changes and predict the future state of the Arctic ecosystem, it is essential to unravel the relationship between ecosystem functions, such as primary production, secondary production and gas exchange, with environmental drivers. In addition, the susceptibility of ecological key species, e.g. Polar cod Boreogadus saida to climate change must be understood to predict the future capacity of the Arctic to support living resources and conservation aims. Furthermore, the coupling of biological and atmospheric processes, such as aerosol production, are barely understood. PS 106 and other expeditions (e.g. PS92 "TRANSSIZ"; "N-Ice"; "MOSAiC") were designed to investigate these scientific challenges in a multidisciplinary approach, and thereby make an important contribution to a holistic understanding of the physical, biogeochemical and biological transformations of the Arctic in atmosphere, sea ice and ocean. With its biological and biogeochemical, and physical sea-ice measurements in the atmosphere, the sea ice and the ocean, PS106 is an important predecessor of the large international MOSAiC ice-drift of Polarstern as mentioned above. In fact, PS106 is regarded as a unique mini-MOSAiC setting, where new fields of cross-disciplinary scientific work have been established. This was only possible in the framework of the PS106 expedition, see the expedition cruise report (Macke & Flores, 2018, in press at AWI). The conference reflects the highly international character of polar expeditions by the German research ice breaker Polarstern, which provides nearly 30% of its capacity to non-German research institutions from over 20 nations (source: AWI). During PS 106,one-third of the participants were foreigners, coming from seven different home institutions. Through the inclusion of representatives from the large international initiatives N-Ice and MOSAiC we expect a highly international mixture of attendees at the conference. Ideally, the conference programme will be designed after receipt of all abstracts. Therefore, a list of speaker/presenter is not ready, yet. Typical sessions however will be organized along the above mentioned specific topics. The two day program, jointly set up by the Conveners, the local organizing committee (LOC), and the scientific organizing committee (SOC) consists of plenary sessions with invited keynote lectures, poster sessions, discussion sessions and social events. Synarc is hosted at the "Hanse-Wissenschaftskolleg in Delmenhorst" with no venue costs for the conference participants. Some funding from AWI, TROPOS and the conference venue is available to cover travel costs for invited speaker, a social event (ice breaker) and minor logistic costs.